No matter what you are selling, you know that the best prospects are those who are referred to you. First, because they desire what you can provide. Second, because they already have a degree of trust and belief that you can deliver. But if referrals are not producing enough growth fodder, this article will help you get your thinking cap on to discover new ways of targeting good prospects. Revenue potential is obvious, and in some cases, the easiest of the two to clarify. For example, B2C marketers can target high net-worth individuals and B2B marketers can target larger companies. The formula is dead simple; prospects with capital can spend more than those who do not. No mystery there! 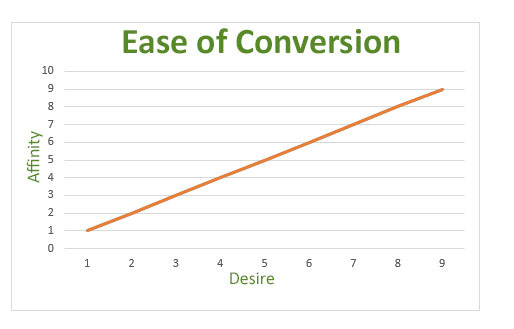 Targeting based on ‘ease of conversion’, on the other hand, is somewhat more difficult and this is where most marketers fall down. They are quite good at identifying prospects with money, but not so good at finding those who are willing to part with it. Our ability to convert a prospect depends on many variables. Do they trust us? Like us? Understand us? These are qualities which, when targeting new prospects, do not exist. The ease of conversion depends on these qualities but they are imparted after a relationship has been struck up, not before. Therefore they cannot be used in the initial targeting process. Propensity to believe is the likelihood that our message will find a home in the heart of our prospect. Those with a propensity to believe will have built-in receptors for our message. If we can target prospects who have receptors for our message, our success rate will dramatically improve. So… how do we identify those who have a propensity to believe? First, we focus on those who have ‘Commercial Intent’, that is, those who are seriously desiring to do something with their money. It is commercial intent which has made Google the juggernaut that it is today. If a prospect is searching for ‘wealth managers in Burbank’, you know they have a need and a desire to fill that need. This is the magic behind search marketing. Their need is like a hole which must be filled and they desperately desire to fill it. They want to believe that you have the solution. Thus those with commercial intent have a built-in propensity to believe. If you don’t screw it up, their natural inclination is to convert. Search marketing is my go-to strategy for identifying those with commercial intent. It takes real know-how and experience to make search marketing work, but once you have all the variables dialed in, it becomes a cash cow. It was back in college in the 80’s that I first learned about psychographics. You can think of psychographics as ‘psychological affinity’… or more simply, ‘common ground’. If you were from Poland and spoke Polish, wouldn’t you rather do business with someone who also spoke Polish? If you would, this does not indicate that you are racist. It merely confirms that it is human nature to gravitate towards the familiar. It makes us comfortable. You can use this in your targeting strategy. When you are coming up with your targeting strategy, think of people groups or markets which have similarities with you. Consider education, professional background, race, religion, charities, associations, sports and social groups. In other words, target in reverse… who are you? What is your background? Get out a piece of paper and start writing. Then use that information in your targeting criteria. The higher the desire AND affinity, the more propensity they will have to believe… and CONVERT!